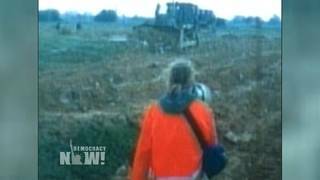 Rep. Adam Smith: “The Israeli Government Did Not Do a Satisfactory Investigation” Into Rachel Corrie’s Death | Democracy Now! AMY GOODMAN: We’re joined on the telephone now by Washington Congress member Adam Smith, who took a letter to the office of Israeli Prime Minister Ariel Sharon, on your behalf. Welcome to Democracy Now!, Congressman Smith. REP. ADAM SMITH: Thank you for having me on. AMY GOODMAN: Can you talk about this letter that you delivered? What did it say? AMY GOODMAN: What was their response? REP. ADAM SMITH: You know, “Thank you.” I mean, I don’t want to exaggerate here. It’s not likely that they’re going to take the letter and, you know, all of a sudden do things differently. But I think it’s really important that representatives of the U.S. government make it clear to Israel that we disagree with the way they have handled the situation. They continue to try to put pressure on them to handle it better. I also think it’s important that our own State Department takes steps. Congressman Brian Baird and I, among others, have cosponsored legislation for us as a nation at the State Department to do our own investigation with the cooperation of the Justice Department, which they have not yet done. You know, that, too, would be a step forward. So, I think it’s just — it’s all part of the process of making sure that this issue continues to be in the public consciousness and that people understand that it’s not done and it’s not satisfactorily been completed. AMY GOODMAN: The letter also contained a quote of, well, then Secretary of State’s Chief of Staff Wilkerson saying that an investigation needed to be done. REP. ADAM SMITH: I think, actually, the quote was a little bit stronger than that, that found that the investigation was — I forget the exact phrasing, but anyway — inadequate, that basically, we had wanted a full, you know, a full and fair investigation. We don’t think we have gotten one yet. Please move forward. AMY GOODMAN: There is going to be a subcommittee hearing on the State Department’s human rights report, that you’re going to speak at on behalf of the Corries on Thursday. What are you going to say? REP. ADAM SMITH: I’m going to attend. I never know exactly — we have witnesses and so forth, and I’m not the chair or ranking member on the committee, so I never know when they’re going to get to me. But, you know, I will be there and certainly try to speak. And I will say the same thing to them that I just said you to. REP. ADAM SMITH: That we do not have a, you know, full and complete investigation. I think we need to continue to put pressure on the Israeli government to do one, and also to do one ourselves. AMY GOODMAN: Brain Avery, another peace activist who had his jaw shot almost off by the Israeli military, has gone to Israel to demand justice. Tom Hurndall was shot by an Israeli soldier a month after Rachel died, and he ultimately died. Now, his father is a lawyer from Britain. He went and did an investigation himself, because he wasn’t satisfied with the investigations that were being done. Many feel it’s because of his legal skills that, in fact, a soldier was indicted for the death of his son. Craig Corrie, what are your thoughts on that? CRAIG CORRIE: Well, I think that was largely due to Anthony’s legal skills and the time that he spent there. Of course, they had to spend a lot of time in Israel to try and get Tom to the position where he could come back home. I also note that the — there was a coroner’s inquest in Tom’s case and also in James Miller’s case, and — who is another person that was killed about the same time Rachel was and within about two miles of Rachel. And so, the London police are doing an investigation. AMY GOODMAN: James Miller, being the cameraman who had gone from Iraq to Gaza to — or to the Occupied Territories, not sure where he was killed, but killed as he was filming children. CRAIG CORRIE: Yes. He was, I think, just about two miles to the west of where Rachel was killed, along that same border with Egypt and in Rafa. And at any rate, the London police are doing an investigation themselves into the death of those two British citizens, and in fact, have come to our country to talk to an American citizen who was a witness not only to Tom’s killing, but also to Rachel’s. It seems to me if England can send policemen here to investigate Tom’s killing, that we should surely be able to talk to that same witness in our own country about what happened to Rachel. AMY GOODMAN: What other leverage do you think or pressure can be brought Congress member Adam Smith, and what about the very close relationship that the U.S. has with Israel, certainly has clout — I think Israel, the number one recipient of U.S. foreign aid? REP. ADAM SMITH: Yes. That’s true. It’s very, very difficult. Certainly, we want to continue to make the point, but there are many, many issues going on right now in the Middle East with, you know, the Israeli planned pullout of Gaza, you know, with the sudden break in the peace process. At least in a more positive way than it was before, there are, you know, many, many issues and many difficulties, but that doesn’t mean that they can’t deal with this one. And I think we need to continue to make that point. AMY GOODMAN: What are your thoughts on the divestment campaigns that are being waged on college campuses to divest — that the U.S. government should not be supporting Israel? The World Council of Churches, also the Presbyterian Church? REP. ADAM SMITH: I don’t support that. I don’t think that we should divest and walk away from Israel. While there are certainly many things they have done wrong, they are also in a very, very difficult situation. You know, they are — their existence is threatened and, in fact, not recognized by a good many of their neighbors. And I think we need to continue to try to work on that relationship. Now, obviously, there are aspects of it, certainly, the cases that you have laid out, where U.S. citizens or British citizens are harmed or killed over there, they need to do an adequate job of investigating it. And I think what’s coming out in the Corrie case and those other cases that you mentioned is they don’t. We certainly need to put pressure on them to change that. But, you know, relationships are very, very complex in international policy. I don’t think it would be wise or fair or the right policy to say, okay, we’re just not ever going to deal with Israel again. There’s too much else going on. We need to try to do both. AMY GOODMAN: By the way, just the latest news on the case of James Miller, the journalist who was killed, the Israeli army has told the family of the British journalist that the soldier responsible will face minor disciplinary charges, despite the investigator’s suspicion he illegally shot Miller two years ago. His wife said the family intends to bring a civil action for damages against the Israeli army and seek judicial review of the decision not to prosecute the soldier for murder. How much support, Adam Smith, do you have, for — in Congress, in the Senate — for demanding an investigation of the death of Rachel Corrie? REP. ADAM SMITH: You know, it’s hard to say. I forget how many cosponsors there were on the resolution that Congressman Baird and I introduced. I want to say it was a fairly high number. There’s a fair number of people who are paying attention to this, then trying to move it forward, but really, it’s Congressman Baird and I who are focused on it. Yes, it is an issue, but fortunately, you know, for other members of Congress, they have a lot of other issues, as well, and how do we make sure that we keep this up on the front burner. That’s why tomorrow’s hearing is so important. That is something where other members of Congress will see, maybe on C-span, it will get some attention. That’s what we’re trying to do now, is to keep attention on the issue so we can get as many supporters as possible and try to move it forward. AMY GOODMAN: Craig and Sarah Corrie, the father and sister of Rachel, what are you doing in Washington now, and what kind of response have you gotten from Congress and the Senate in calling for an investigation? SARAH CORRIE SIMPSON: First, just to respond to what Congressman Smith was saying, I think there were 78 sponsors on HCR111 which was the resolution in the House to bring an investigation, an independent investigation, into Rachel’s killing, and we were very grateful for that resolution. We have been told that having 78 members of the House sign on to that bill was very significant. Oftentimes in cases like these, you would not see maybe even 10 or 15 names go on to a bill that would have sort of this political issue raised. So, we were very pleased with that, and I think a lot of that also did come from people around the United States calling in to their Congresspeople, and educating them about this issue. And I think that’s really what we’re doing here in Washington, DC. We continue to educate. On the Senate side, our family has met, I believe, with all of the Foreign Relations Committee members. There’s possibly one that we have not met with, but we have requested meetings from every office. Many of those offices we have been back to a second time. We have met with many of the members from the Judiciary Committee, as well, and as well as some members from the Budget Committee. And that was our focus in coming to Congress. We have had three of my aunts here, as well as my uncle and my father and I, this time around. We were also here back in December. We were here in September. My aunts and uncle were here back in the summer. I think each time we come, we hold approximately 40 meetings in that time. I think we have approximately 16 meetings a day where we’re just running from one office to another, speaking with staff people, trying to get face time with members to just let them know about Rachel, let them know about the lack of an investigation in this case, and oftentimes trying to let them know specifically about Dr. Samir and his family and put a face on who those people were in that house that Rachel was trying to defend. AMY GOODMAN: Any last comment, Jennie Green, attorney with the Center for Constitutional Rights, who is bringing the suit against Caterpillar? JENNIE GREEN: Yes. I’d like to specifically ask Representative Smith whether there might be anything that Congress could do to increase the regulation on a corporation such as Caterpillar so that they cannot continue to claim that, well, they don’t know where their products are going. Could there be an investigation into their activities, and ultimately, could their activities that we have talked about already be regulated? AMY GOODMAN: Congress member Smith? AMY GOODMAN: Thank you, Congress member Smith. REP. ADAM SMITH: Thanks for the opportunity. JENNIE GREEN: Thank you very much. We would be happy to work with you further on that. AMY GOODMAN: Well, I want to give Craig and Sarah Corrie a final comment at this point on the second anniversary of Rachel’s death. CRAIG CORRIE: Well, you know, Amy, I’m sitting here looking and I wish the viewers out there could see a picture of the Nasrallah family and their children. They’re standing where their home used to stand where Rachel was killed. And when I first saw this picture, it was just taken a few days ago. They’re remembering Rachel two years after she was killed. And yet, they have had their home destroyed. The first thing that came to my mind is how much these children have grown since I have seen them. Of course, what the world doesn’t really remember is those children were behind the wall that Rachel was standing in front of and had that bulldozer continued on its path, these children wouldn’t have grown. And so, I hope that I can look at pictures every year of the Nasrallah children and see their smiles and see them continue to grow and become the sort of citizens of the world that we would all wish they could become. AMY GOODMAN: On that note, I want to thank you all very much for being with us. Sarah and Craig Corrie in Washington, DC. They’re lobbying Congress members, and in New York, Jennie Green of the Center for Constitutional Rights.